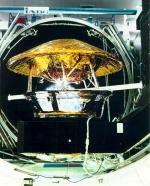 The Huygens probe separates from Cassini on December 24 and arrives at Titan on January 14. The Huygens probe is shown here undergoing testing. Photo courtesy of JPL/NASA. December is a month for conjunctions ... all in the morning sky! First, on the morning of the 5th, Venus passes just over a degree north of Mars. They differ drastically in brightness, Venus blazing at magnitude -4 while poor distant Mars is only 1.7 — and also in size, with Venus' gibbous disk showing a disk more than three times the size of Mars (which is also gibbous). The reddish color of Mars may be particularly striking next to the brilliant white of Venus. Then, two nights later on the morning of the 7th, Jupiter makes a very close pass with the late third-quarter moon. The moon will actually occult Jupiter in the midwestern and eastern US, but alas, that happens before moonrise here, and by the time the moon rises just after 2am, they're already separated by half a degree. So a Callisto eclipse might actually show some of the outer corona, but the other moons would appear much, much bigger than the sun, and wouldn't look much like a solar eclipse on earth. Good news for you eclipse-chasers — no need to start saving up for a ticket to Jupiter! Back to conjunctions: on the morning of the 29th, Mercury passes about a degree north of Venus. The actual conjunction happens the previous evening, but the pair doesn't rise here until nearly 5:45. Their phases are both gibbous, with Mercury showing just over half a disk and Venus closer to full. Saturn is the only planet visible to evening observers this month, rising a bit after darkness falls. The rings are starting to close up, showing a 21-degree inclination: much less than what we've been seeing for the past few years, though still plenty to show all their features. In addition to the rings, don't forget to look at the moons! You can't see Prometheus, the tiny moon which was recently discovered to be stealing material from Saturn's mysterious "braided" F ring; you can't even see the F ring from here. But you can see Titan! Cassini has already given us some amazing images of cloud-shrouded Titan, the second largest moon in the solar system (after Ganymede), but there's a lot more to come! On December 24 at 6p.m., the Huygens probe will separate from the Cassini spacecraft and begin its 21 day journey to Titan, where it will plunge through the atmosphere and, with any luck, tell us what the surface is like. Happily, unlike Prometheus, Titan is easy to spot — it's the brightest of Saturn's extensive satellite collection, at eighth magnitude an easy target for any telescope. Why not set up a telescope on Christmas Eve, show Saturn and Titan to your friends and family, and tell them a story about this interplanetary sleigh?